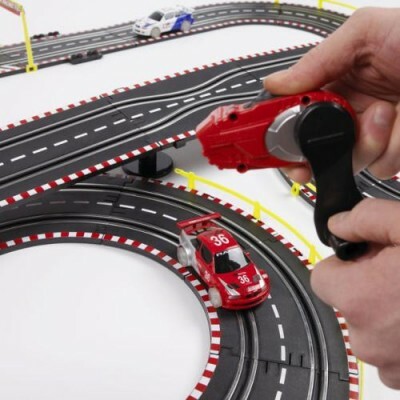 The Hand-Powered Generator Car Racing Toy allows you to race two cars around a track without needing either battery or mains power. The cars draw power from the electricity you provide from winding the handles on the hand generators. The Generator Racing game allows you to play on a track with two slot cars, the track has the look and feel of a classic mains/battery powered track. Unlike the car racing tracks of old, operating the cars takes more involvement than holding down one button. The cars race around the track on electricity generated by the controllers. Each controller has a crank/wind up handle, this needs to be turned rapidly, the kinetic energy from turning the handle is converted by a generator within the controller into electricity. This feature not only allows you to play a racing car game without any worries over battery power or over the drain on mains electricity but also adds an extra level of difficulty to racing. As the turning of the handle powers the car, the speed of turning it impacts on the speed of the car, slower turns are needed for the car to corner without rushing straight off the track. 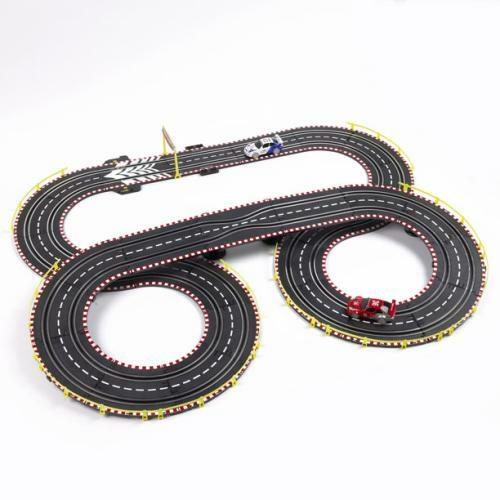 The game comes with 2 cars and 2 generator controllers, the track is supplied in 30 pieces that allow a variety of track layouts to be constructed. The Hand-Powered Generator Car Racing Toy is just £39.95 plus £3.95 delivery.